The iPhone 8 rumours continue this week with a slew of leaks and some new interpretations derived from the HomePod firmware code, which has proven to be a veritable gold mine thus far. The fresh spate of reports include details about the iPhone 7s Plus, which along with the iPhone 7s is expected to be launched alongside the iPhone 8 come September. Finally, a report reiterates Samsung’s large role in the iPhone 8’s OLED display supply chain. Starting with the iPhone 8 rumours, the latest piece of information to be derived from the HomePodfirmware indicates the anticipated Face ID facial recognition feature will work even when the phone’s lying flat. The code contains the words ‘resting’ alongside ‘unlock’, leading to the assertion, and was spotted by iHelp BR – the same site that spotted the code pointing to the iPhone 8’s ability to record 4K videos on both front and rear cameras. The detail that the iPhone 8’s facial recognition feature will work when the smartphone’s lying flat on a table isn’t especially new, with KGI Securities’ Ming-Chi Kuo making the same assertion last month. Kuo, separately, now notes that Apple will do away with Touch ID entirely – not even including it on the power button, matching earlier rumours that said the company will rely solely on Face ID instead as a means of unlocking the phone and authenticating the user. Plans for embedding Touch ID below the glass of the display have been scrapped, Kuo reiterates. A separate leak of the iPhone 8’s display assembly, shared by SlashLeaks, shows no space for the Touch ID fingerprint sensor. Another leak shows the vertical dual camera alignment of the iPhone 8, and comes from tipster Benjamin Geskin. 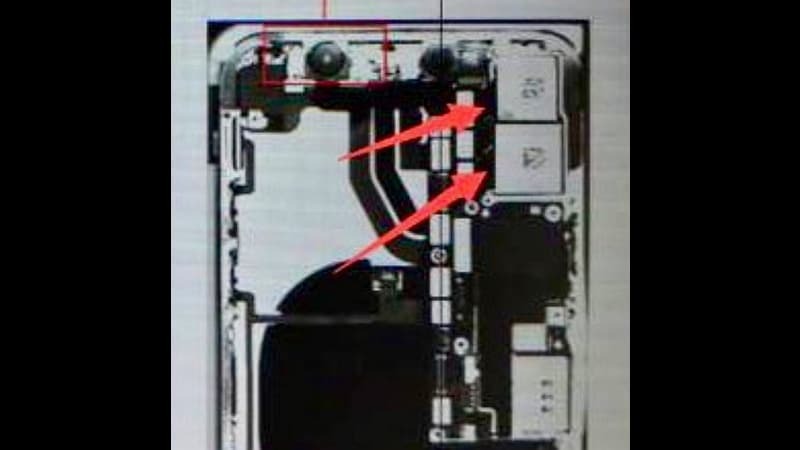 As seen from the schematic shared on Twitter, the smartphone appears to have two camera sensors on the rear panel, with Geskin adding the smaller represents the wide-angle lens, and the larger represents the telephoto lens. Next up, is the iPhone 7s Plus. 9to5Mac cites tipster Sonny Dickson as the source of new iPhone 7s Plus dummy images. The dummy is seen to sport a glass back, pointing to the inclusion of the wireless charging feature that’s long been anticipated for the iPhone series. There are also no antenna lines visible, a design decision that could be due to the use of the glass material. Finally, South Korea’s ET News reports that Samsung has ramped up its OLED display production to full capacity this month, thanks to the demand it has from Apple and the iPhone 8. At full capacity, it is expected to produce 124 million 6-inch panels and 130 million 5.8-inch panels, however, the report adds that the yield on the panels is very low that’s to the design Apple has proscribed.